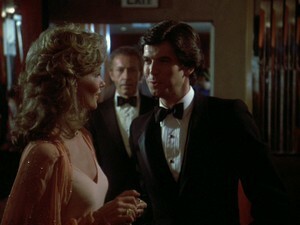 And on we go, to the second (or rather, first) episode of Remington Steele! As mentioned before, Tempered Steele was actually the pilot episode. I wonder what changes the show underwent between the time this episode was shot and when “License to Steele,” the set-up episode that ultimately aired first? Let’s see! Oh, ho! Changes already, and we’re only in the opening credits. Laura seems to have added another client. Hello, pilot! And another! 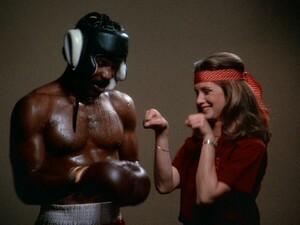 Boxer man seems to be averting his eyes from Laura – perhaps because he’s embarrassed for her in that bizarre headband? So that’s where Amanda King got her sense of style! But what happened to this guy? 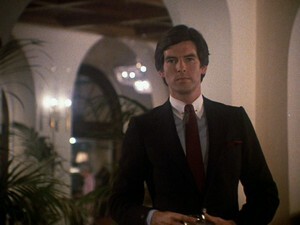 “… he’s assumed Remington Steele’s identity. “… and he takes the bows. “I can get the job done. “We never mix business with pleasure. But on to the episode proper! The episode opens with the jaunty Remington’s theme music in the background. We see a restaurant bill presented on a silver tray. 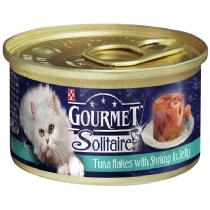 It lists “Gourmet Dinner” at a hefty $146.80. Wow. The gourmet dinners I buy are a lot cheaper than that! Hm. Whatever his other talents, I don’t think our man could make a living as a forger! We cut to the title card over a busy hallway. 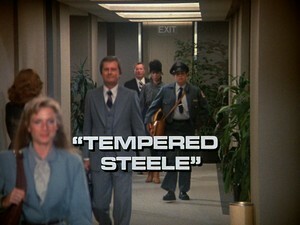 Tempered Steele … wonder what that means? Perhaps we’ll find out. 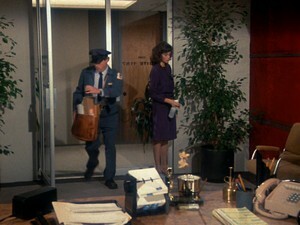 We follow a slightly portly postman into the upscale offices of Remington Steele Investigations. The offices seem to be devoid of clients, so Bernice is spritzing the plants! 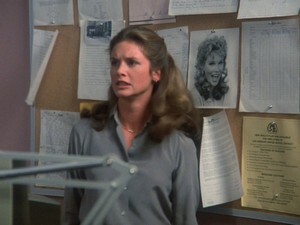 Bernice delivers the mail to her boss. Laura is engrossed in high-tech research. Murphy arrives, bearing take-out (for himself and Bernice only, it seems.) Mr. Michaels is more casually dressed than the secretary. Haven’t you ever heard the adage, “Dress for the job you want,” Murphy? Bernice is having rabbit food; Murphy (who apparently isn’t expecting to be kissed today) has pastrami with horseradish. Their flirtatious snarky banter is interrupted by a howl from Laura! They rush in to see whatever is the matter! “What is it?” Bernice asks. 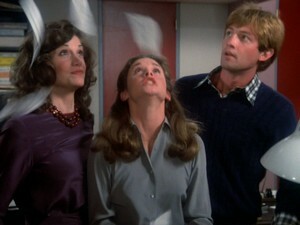 “Look at these bills!” she exclaims, throwing them dramatically aloft. I get the impression that she’s upset! Good guess! But … no. It’s Nadine! 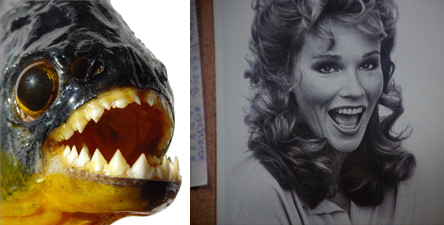 The peroxide piranha! Seems a bit harsh … but I guess I can see a resemblance. Murphy points out that it was Steele’s assignment to keep Nadine occupied, and “he seems to be doing an excellent job!” They haven’t seen Nadine in weeks. But the case has been closed for three days. Laura suspects they’ll never see their figurehead “unless his credit or his stamina runs out!” Which upsets you more, Laura? Murphy, concerned, places a comforting hand on Laura’s back as he urges her to calm down. I don’t think that’s going to help, Murph! Laura is armed and dangerous! something fishy! 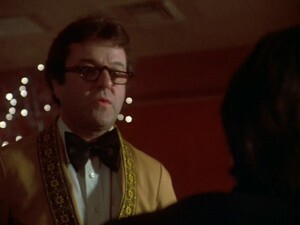 Specifically, a caviar-spread cracker about to be consumed by, Mr. Steele’s voiceover informs us, the ravenous Nadine! Nadine proposes going somewhere they can do some serious nibbling. Mr. Steele calls for the check! 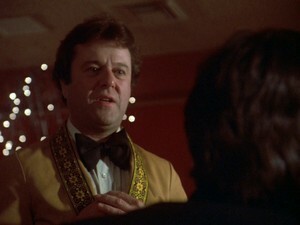 The waiter regrets to inform Mr. Steele that his account has been closed. Awkward! Steele produces a credit card as alternative payment. He is moved to do something he’s never done before: present his companion with the brass nameplate that designates this as his special table, as a forget-him-not! 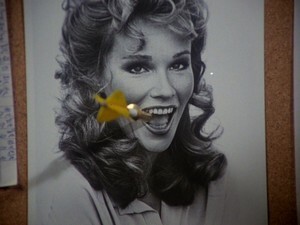 Nadine, who seems not to have gotten a set of $5,000 teeth from Grant Tinker, is impressed. 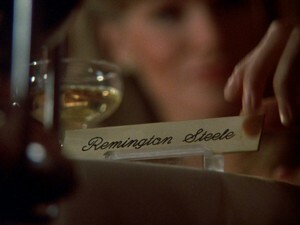 “Oh, Remington!” I think this might be Mr. Steele’s lucky night. But wait! 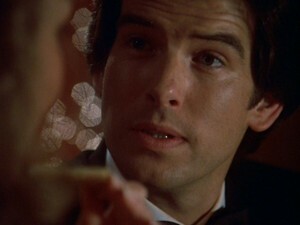 The waiter returns to inform Mr. Steele he has orders to confiscate the detective’s credit card. Mr. Steele seems … disappointed? Alas! Mr. Steele never carries cash. “It’s so bulky.” Nadine offers to pay, but is taken aback at the tally. “You’ve upset the lady. If I weren’t so annoyed, I’d be embarrassed,” Steele blusters. He vows to repay her over breakfast in the morning. Oh, dear. Here comes more trouble. Maitre’d Claude will have to be taken care of, too. Uh, oh. The doorman has his hand out, too. I wonder if Nadine is beginning to think her dinner companion is all wet? I’ll stop there with a few questions for discussion. 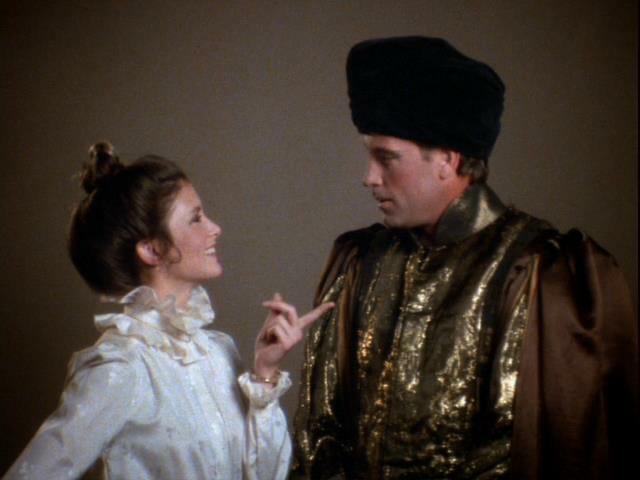 How long after “License to Steele” do you think this episode occurs? 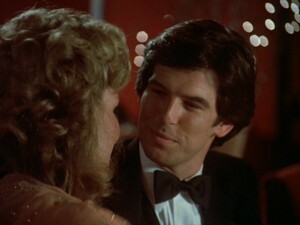 Does Mr. Steele have any attachment to Nadine, or is it all part of the job? 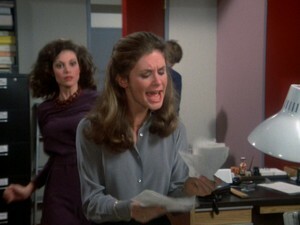 Is Laura more upset about the money, or the womanizing? I really like this new opening. I think I had it memorized by the 3rd episode! Funny comment about Nadine’s teeth – I never liked them either. 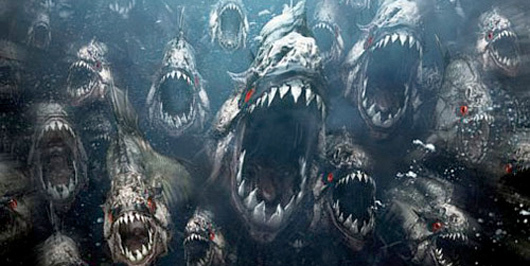 And those pictures of the piranhas – lol. Good catch on the difference of the signatures! You can tell that Pierce and Stephanie probably have different personalities in real life (as well as Steele & Laura) by the differences in those signatures. I’m no handwriting analyst, but Laura’s looks much more conservative, with bolder/harsher strokes and Steele’s looks much more flowing and artistic. Hmmm, I wonder what that could mean?! What the heck is up with the nameplate? Is that like giving someone your ID bracelet? What woman would want one of those? Perhaps it was all the rage among the wealthy at the time? As to your questions… This has to take place several weeks after the Lavulite case, at least, because of Murphy’s statement of not seeing Nadine for weeks. But according to the commentary, Tempered was ordered as the pilot to show this set-up six months down the road. So Laura has quite a long time to sit and stew about the mounting bills!! I do think at the moment she is really much more concerned with the financial liability that this new Mr. Steele poses to the organization. Oh, she is also a bit jealous of the attention that Nadine is getting, but I believe that money is winning this argument at the moment. I believe that Mr. Steele has absolutely no emotional attachment to Nadine except that she is a pleasant diversion at the moment, and is meeting other needs that the man has. 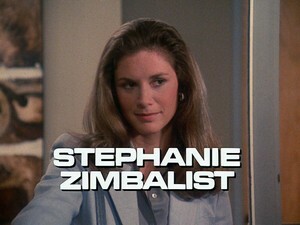 Given the choice of Laura or Nadine, I think Mr. Steele would pick Laura in a heartbeat. Okay, here’s a question that has bugged me forever…What 4 person operation gets THAT much mail in one day? 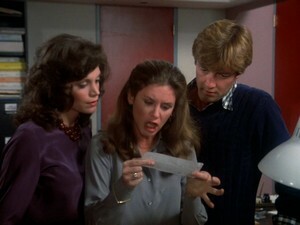 It was very nice of our Mr Steele to forward the receipts, don’t you think? At least he’s attempting to do the task entrusted to him. Speaking of the girl, I think that the producers picked someone as opposite from Laura and one could get, for Nadine. I think Laura’s mostly got her temper up about the money, it’s really her livelihood on the line, here. Is that the “Temper” in the title? Hmmm, we’ll have to think about that. Who loses their temper more in this episode? 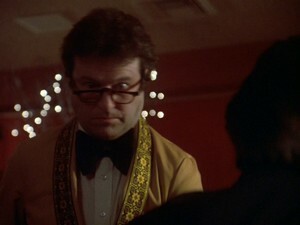 Okay, one more thing…If I was a fly-by-night con-man, wouldn’t I have a little bit of cash stashed away? What if the con went down and I couldn’t get back home? Seems a little sloppy for our hero. Maybe they just got back after a long holiday weekend and that’s the reason for so much mail? Good point. And as to your last point, I wonder if this con-man will EVER learn that lesson (Beg, Borrow, & Steele, anyone?)?? 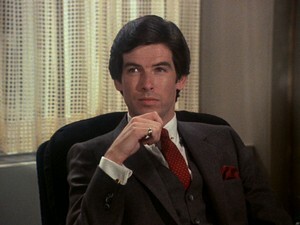 By the time BBOS comes, he’s been Remington Steele for 4 years, so he has lots of security… Currently? He’s too new at this-which is a lot of the fun in Season 1! 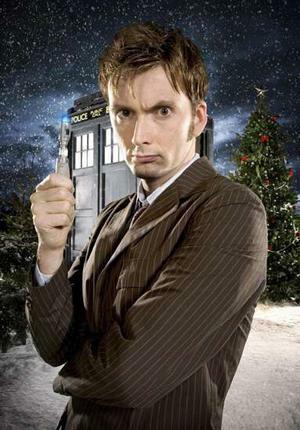 He plays the bumbling detective very well. Another reason to love these discussions … I hadn’t thought about it that way, Melissa – good point about feeling more secure by BBS. Perhaps he’s already gotten in too deep in this role already and feels a false sense of security. Boy did Laura burst THAT bubble!! I agree he is too smooth about Nadine paying the cheque. 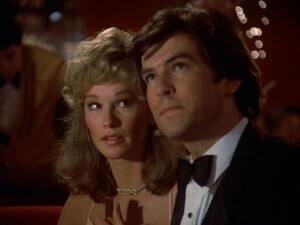 He has definitely done the gigolo before – he’s comfortable with the situation. Then again he is not one to show his emotions. Good catch on the signatures not matching. Weird that they don’t because in a Season 3 episode ?Steele Framed?, Laura asked if Steele was still using RS signature and he assured her he was. 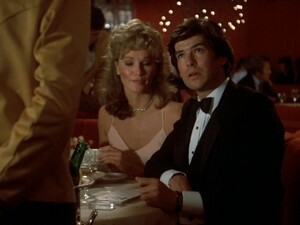 Are we sure the receipt is Pierce Brosnan’s signature? I thought I read that he was left handed? Laura was more concerned about the money than Nadine; the money came first. However she didn’t call Nadine a peroxide piranha for nothing. She was jealous. Laura (and Stephanie) is left-handed. Remington (and Pierce) is right-handed. 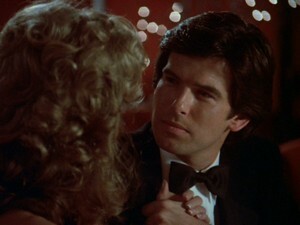 I don’t think he was a gigolo, per se, just used his charms as part of the cons that he and Daniel would run. Melissa, I think you are right, too, in that he may not have been comfortable with the lady paying because it was not part of this particular scenario. 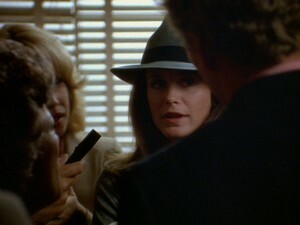 And it does seem that he is controlling his temper to unleash it at Laura. Yes, Pierce is right handed and that signature looks to me like his handwriting. If you google his signature, you can see the similarities. That is a lot of mail for one small office. Presumably 3/4 of it is junk mail and the rest are Steele’s bills piling up. Though I’m loathe to say it, I suspect our man has made a career of, to quote Blanche Dubois, “relying on the kindness of strangers” – specifically women. The ease with which he accepted Nadine’s offer to help him out of this jam suggests this is a scenario with which he is very familiar. How many times in the past has he “lost” or “forgotten” his credit card and had to accept his lady friend’s generosity with a promise to “make it up to you over breakfast”. I’m sure he would be affronted at the suggestion that there is a hint of gigolo about him, but that’s what it amounts to. Oh, I’m sure that he’s run that scam before – divesting rich women of some of their excess cash. I love the piranhas discussion!! I always thought why did they chose a woman with those teeth to make a close shot from her eating caviar almost in slow motion. .
And about RS signature, I doubt those are Pierce’s hands. I can’t see them similar to another close shot. I think Pierce’s own signature needs more place to expand. Remington’s seems very neat. Not Stephanie’s style, but close. I think that as Pierce is a man who likes to paint,he would have a more unstructured signature. About Laura, she is more upset because he is spending the money on a woman. (a weekly entertainment) He should have tried with something more permanent. Maybe then she would have been more kind with his expenses. As why he didn’t carry cash, I guess he was proud to have the chance to sign a credit card receipt, and after that, receive an approving gesture from everyone that could see who was he (the famous RS). He loves success and glamour, and everyone is permissive with famous people. Nadine? I think she went to the dentist after the episode, and is still there. LOL – Nadine still at the dentist!!! Yes, he certainly does seem to love the success and glamour that comes with being RS. As to the signature (Keri, where did you get that picture of the signed credit card – I just looked at the ep and can’t find it) … to my very well trained eye ;), those look like Pierce’s hands, and I doubt at this stage of producing the show (it was the very 1st ep shot), that they would use a hand double for the actors. 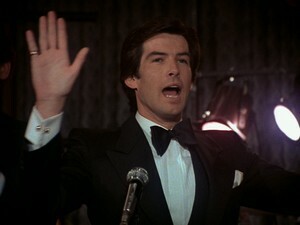 The shot of RS’s hands is the first one after the credits. Take a close look on his nails. And I think PB’s fingers are thinner tan those ones. I won’t go on with my explanations… ;). I don’t doubt about your very trained eye. Maybe I am watching with my astigmatic eye…(my left one). I think they could had been using a hand double a this stage, but not an specific one. But I can’t be securely, because don’t know anything about the rules to use a double. Thanx, Ines, I don’t know how I missed that shot! I can see your point about it still being a hand double, but I still think it’s Pierce. And, look at the date on the credit slip – 9/20/82. Didn’t the show premiere on 10/2/82? Are we going back in time for this episode?? 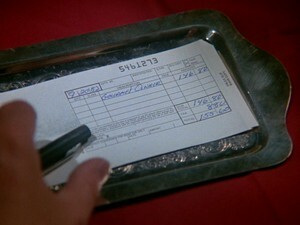 The shot of Steele signing his check is a very quick sequence at the beginning of the episode. Didn’t somebody point out that PB has something wrong with his fingernails that might point to him having psoriasis? I can’t tell from the screenshots I took whether his nails seem funny. I found that signature shot – Ines was kind enough to point me in the right direction. I don’t think PB’s fingernails got bad till after Bond (getting them slammed into walls or caught in stunts). He did, however, have a habit of biting them, so they are always very, very short – even during RS. Speaking of nails, Stephanie usually keeps her nails pretty short, too. Many of the close-ups of her hands during the run of the show look to me to be a hand double (you can tell by the length of the hand models nails and the manicure). Where was the restaurant scene filmed?